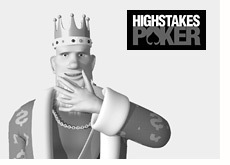 We are now five episodes into the fifth season of High Stakes Poker, and so far the action has not disappointed. The first five weeks have featured a great mix of young and veteran talent - it's interesting to see the way that the older players interact with the younger ones. I can't help but notice that there seems to be a bit of disdain towards the younger players.. This season has featured a number of very large pots. The presence of Tom Dwan at the table has helped to really juice up the size of the pots, as he is prone to play any hand in any position. I like the current make-up of the table, and I can't say that I'm very much looking forward to the inclusion of names such as Phil Laak, as he can tend to be a bit grating over the course of a full hour. David Benyamine - playing well. Was involved in one huge pot against Daniel Negreanu (where he flopped a set and turned quads) and seems reluctant to get too involved in the action. I don't think that David will get involved in any more large pots this season, unless he flops the nuts or close to it. Daniel Negreanu - has been felted twice so far this season, continuing his absolutely horrid run on the show. Negreanu was clearly tilting during the fifth episode, but can you blame him? Doyle Brunson - has only gotten involved with premium hands, and doesn't seem to want to mix it up too much with the younger players. Can't really criticize his play this season - he is just playing pretty tight. Eli Elezra - very loose pre-flop, but is clearly a very tough player post-flop. Barry Greenstein - has clearly altered his game for the show. Doesn't seem to be too interested in playing post-flop poker, electing instead to make huge pre-flop raises with premium hands. Peter Eastgate - has made some good plays this season, as well as some much-criticized ones (namely folding trips against Dwan). Eastgate has certainly held his own. Ilari Sahamies - "Ziigmund" is clearly very uncomfortable at the table, and has just not played very well at all. People who were expecting a hyper-aggressive Sahamies have been very disappointed. I've lost count of the times that "Ziigmund" could have made a move on the river, but elected to check it down instead. He seems out of his element in a "live" cash game setting. Tom Dwan - has clearly dominated the action so far this season, and has put in the most impressive overall performance. He handles himself well at the table, despite all of the grousing and nit-picking from the older players. Dwan clearly has a very long and profitable playing career ahead of him. All in all, a great season so far. Anybody who doubts that a player like Tom Dwan belongs at the table obviously hasn't been watching this season.